In most cases, customers get in touch with businesses because they have a question they need answered, or a problem they need fixed. But what customers need can vary dramatically. These questions and problems come in all shapes and sizes. Some are easy to answer, some are hard. Some are quick to answer, some take a long time. Some questions are really common, some are rare or even unique. Some questions benefit from providing visual instructions, some can be resolved with words alone. When you consider how a business could answer all these questions, there are multiple options. One option is to hire support staff, and train them in answering the questions. This is personal, but is expensive and time consuming. Another option is to use computers instead of support staff (this could be via a website, or a voice answering system, etc. ), and have the system attempt to answer the questions without human intervention. Computers are cheap and plentiful, but they lack empathy, and only sometimes understand the question being asked. The human language processing technology we have available isn’t good enough yet for computers to understand most of the hard questions people have. So it is clear that some questions simply need people to resolve them, whereas others can be resolved by a computer. Most businesses today get this wrong. Concerned with short term financial costs, they over optimise for cheap impersonal computers, employing them to answer and fix questions that only people can. And worst of all, when it goes wrong, customers get frustrated, annoyed, and start to resent the business. We’ve all experienced this. Calling a business only to get an answering machine full of irrelevant options. Trying to talk to a person but ending in voice-jail, where talking to a person is in fact impossible, and the only option is to hang up and try something else. Or equally as bad, hunting around on a website or an app, trying desperately to find a way to contact a person in the business without any success. This trend of businesses employing computers to automate customer service tasks that humans are better at is getting worse. The latest over-hyped example is chatbots. Chatbots are still computers, they still lack empathy, and the reality is that the technology is not far along in its development. 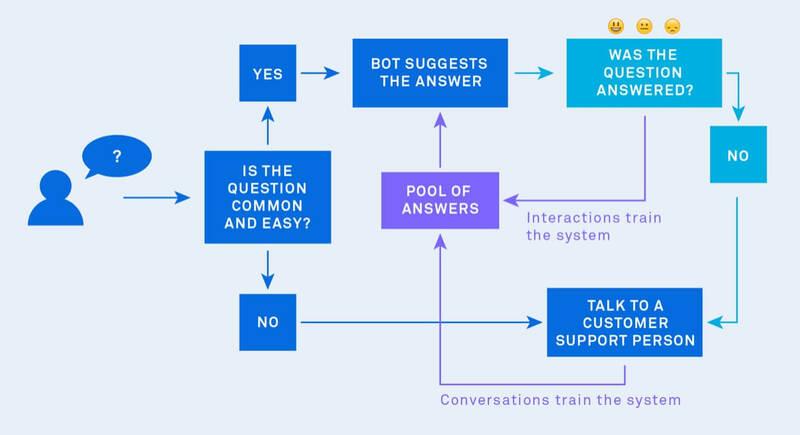 Most chatbots are simple “if this then that” logic trees, which can lead to poor customer support experiences. The exact same technology that is used in the voice-jail experiences we all hate. Meanwhile, these commonly frustrating experiences are happening against a backdrop of customers demanding, expecting, and rewarding more personal connection and transparency in business. Technology has enabled people to contact any of their friends and family anytime in multiple rich ways, and they are increasingly expecting the same from businesses. The younger the audience, the more pronounced this is. The future isn’t voice-jail and faceless website FAQs powered by lacking automated customer service tools. So the key to success then is understanding when customers have common + easy, or rare + hard questions, and when computers can be used instead of humans. When questions or problems are common + easy, customer service automation tools shine. When they are rare + hard, computers come up short. The hardest part is that sometimes, what starts as something that looks common + easy, can actually turn out to be rare + hard. The inverse also happens. What starts as something that looks rare + hard, can actually be common + easy. Customers don’t always find it easy to articulate what they need. So providing world class customer support means understanding what your customers are asking, and designing your support solutions around that. The best of all worlds is customers being able to get the answers they need in the fastest most efficient way, and support staff only working on the rare, hard questions. Answers to common questions can be written down and shared. This is what a knowledge base is – a repository of common questions with answers. The problem with knowledge bases is that businesses try and use them to also answer hard questions, as a way to deflect customers away from their customer support team to keep costs down. These customers with hard questions often don’t find their answer in the knowledge base, and worst of all, it is a dead end. There is no way for those customers to tell the people in the business that the content didn’t help, why it didn’t help, and that they still have an unresolved question. Make it fast to resolve the common + easy questions, either by using customer service automation to direct customers to the answer so they can help themselves, or by allowing support staff to quickly point customers to that same content. When customers are helping themselves, provide a way for those customers to tell the business if their question was answered, or if the content needs improving. 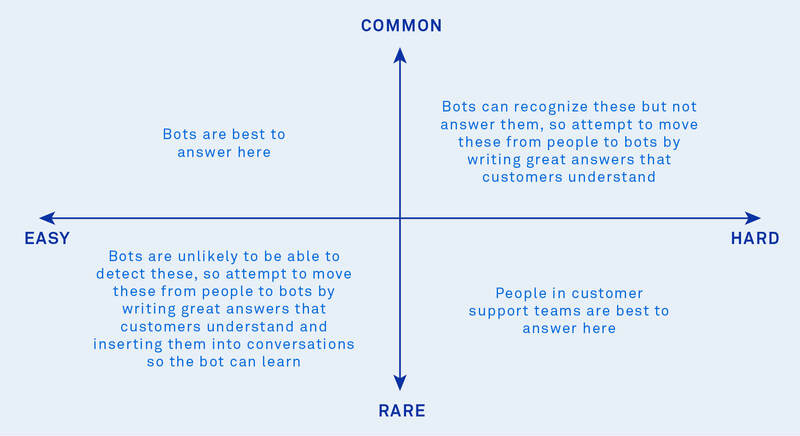 Provide a way for customers who think they have common + easy questions, but actually have hard + rare questions, to move from helping themselves to talking with the support team. Understand when people are asking common + easy, or rare + hard questions. Educate uses machine learning to suggest the right answers to support staff for common and easy questions, enabling them to insert that content into conversations, so people can then help themselves. Make it fast to resolve the common + easy questions, either by using computers to direct customers to the answer so they can help themselves, or by allowing support staff to quickly point customers to that same content. Today Educate suggests content to support staff, and in the future it will suggest content to customers, before they talk to support staff. When viewing an answer, customers can provide lightweight feedback to say whether they got their answer, and if they say they didn’t, this starts a conversation with the author of the content so they can resolve the customer’s question, and then improve the content for the future. All content has the Intercom Messenger embedded, enabling customers to start a conversation with the support team at any time. The opportunity for customer support products is to have the computers teach themselves what questions are common, easy, rare or hard. Or better still, teach themselves when support staff are needed and involve them appropriately. This is where Educate is headed. Appropriately automated customer support. Check it out to learn more about how we’re thinking.